A suicide car bombing on the outskirts of Kabul killed 17 people, including a Canadian soldier and four other NATO troops, one of three separate attacks carried out in Afghanistan on Saturday. The deceased Canadian has been identified as Master Cpl. Byron Greff from the 3rd Battalion Princess Patricia’s Canadian Light Infantry, based in Edmonton. His role was to advise Afghan National Army trainers who teach other Afghan soldiers. "To say that he was highly respected by his fellow soldiers would be an understatement," Col. Pete Dawe, deputy commander for the Canadian training mission, said in a statement Saturday. Armed Forces spokesman Lt.-Col. Christian Lemay said the Canadian soldier's family has been contacted and is being offered support. The death is the first since Canadian combat operations in Kandahar ended earlier this year and a new training mission involving 920 soldiers began. Prime Minister Stephen Harper offered his condolences to Greff's family, saying the soldier "paid the ultimate price serving his country." 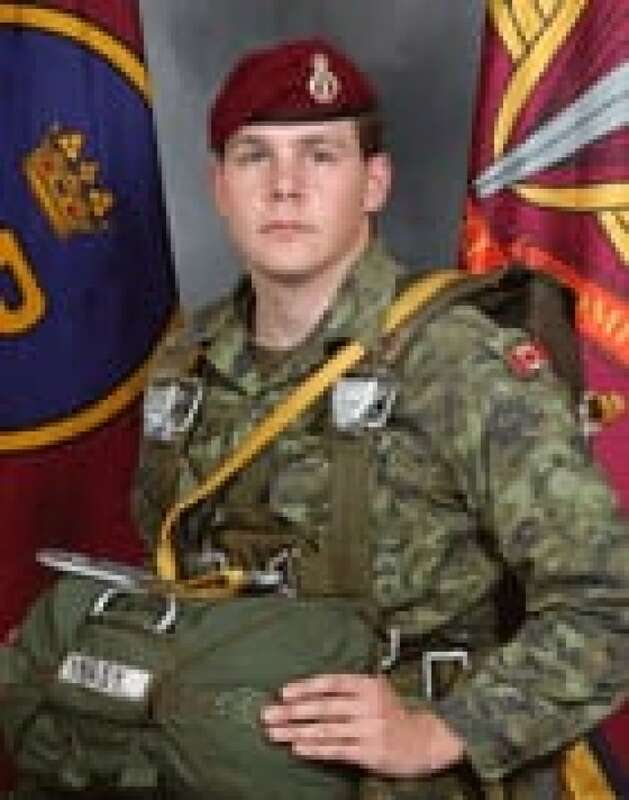 "His life and death serves as an example of the bravery and outstanding dedication of Canadian Armed Forces members on this mission," Harper said in a statement. The blast killed a total of five NATO troops, eight civilian contractors for the NATO mission and four Afghans. U.S. officials had initially said all 13 NATO personnel were American soldiers. 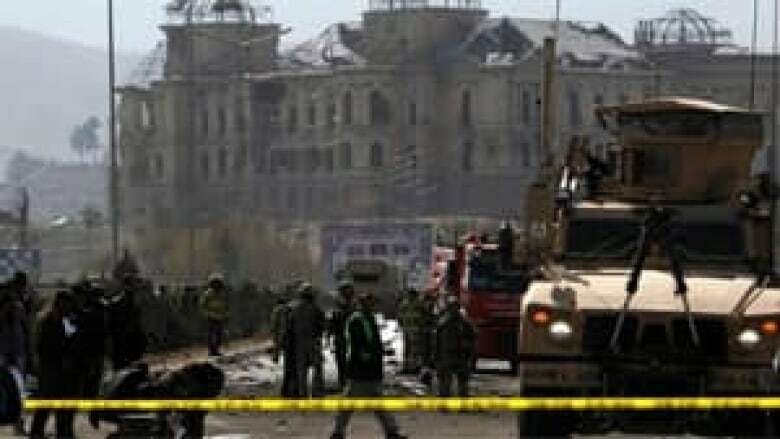 The Taliban claimed responsibility for sending the suicide bomber, who rammed his vehicle into a heavily armoured NATO bus that had been travelling between bases in Kabul, detonating about 700 kilograms of explosives near Darulaman Palace, the bombed-out seat of former Afghan kings. The Afghan dead included three civilians and one policeman. The back end of a NATO bus appeared to have been blown apart and was turned into a charred shell. "A suicide bomber car targeted a convoy of coalition forces. There are casualties among civilians and coalition troops," said Kabul's police chief, General Mohammad Ayub Salangi, at the scene. The Taliban claim of responsibility came shortly after the attack in a text message to media outlets. The militant group said the bomber, Abdul Rahman, was driving a Toyota Land Cruiser SUV containing the explosives. It was the deadliest of three attacks in the day that targeted either the U.S.-led coalition or Afghan government offices in the country. A man dressed in an Afghan army uniform opened fire at a joint NATO-Afghan base in the southern province of Uruzgan, Afghan Defence Ministry spokesman Mohammad Zahir Azimi said. The Australian Department of Defence confirmed three of its soldiers and their interpreter were killed in the attack. Seven Australian soldiers were also wounded. Azimi said officials were investigating whether the gunman was a soldier or a militant disguised in an army uniform. The man was shot dead by Australian troops. Afghan soldiers at the base were disarmed and confined to barracks as a precaution while officials investigated the shooting. In the northeast of the country, a woman blew herself up as she tried to attack a local government office in the capital of Kunar province, a hotbed of militancy along the Pakistan border. Abdul Sabor Allayar, deputy provincial police chief, said the guards outside the government's intelligence office in Asad Abad became suspicious of the woman and started shooting, at which point she detonated her explosives. There were no other casualties in that attack. When it announced almost a year ago that Canada would undertake a training mission until 2014, Prime Minister Stephen Harper's government insisted that troops would be safe because instruction would take place behind the wire of fortified bases. But Kabul has become an increasing focus for spectacular Taliban attacks, including a 20-hour shoot-out near NATO's main headquarters and the U.S. Embassy last month — a gunfight that involved Canadian troops who had just arrived at Camp Eggers in a convoy. Elsewhere in the country, hostilities are still rampant. Afghan and U.S.-led coalition forces conducted operations earlier this month, killing more than 100 insurgents in an effort to curb violence in rugged areas of Kunar where the coalition and Afghan government have a light footprint. Farther south along the Afghanistan-Pakistan border, Afghan and coalition forces captured two leaders of the Taliban-affiliated Haqqani network and two other suspected insurgents in Sarobi district of Paktika province, the coalition said.